Crowns (“caps”) are complete porcelain coverings that provide protection and strength for teeth. A crown is custom-made to look and feel like your natural tooth. Dental crowns are the ideal restoration for a tooth that is cracked, broken, weakened by decay, or has had root canal treatment. If a weak tooth isn’t supported with a crown, it can lead to death of the nerve and/or loss of the tooth. 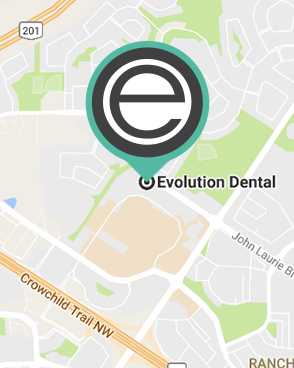 For more information about crowns and other dental restorations, please call Evolution Dental at 403-208-9965 today. We are proud to serve the communities of Cochrane, Calgary and other nearby areas in Alberta. An onlay is a strong porcelain restoration that covers one or more sides of your tooth. Onlays or inlays are required when there has been significant natural tooth damage (from decay, cracks, or previous restorations) that a filling will not be strong enough to repair. Once bonded, onlays restore the tooth’s strength to close to what it was before it was damaged. Onlays are custom shaded to your tooth so that they are virtually undetectable. What Is Involved in Getting a Crown or Onlay? Getting a crown, onlay, or bridge generally takes two appointments. At the first visit, your tooth is carefully shaped and then a digital impression is taken of the tooth. This record is sent to our laboratory, where a highly trained Ceramist custom-makes your tooth crown. 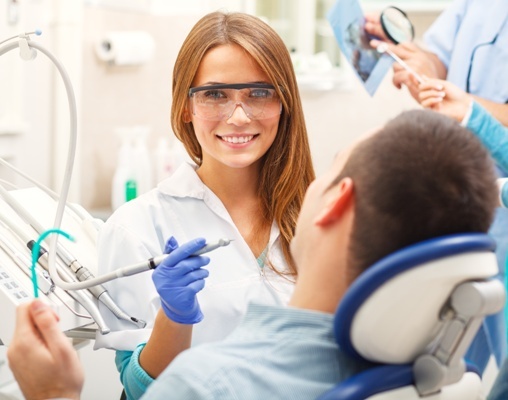 Before you leave your first visit, a temporary restoration is fitted for your tooth. Your second visit will be reserved 1-2 weeks later. The temporary restoration is easily removed and your porcelain crown, onlay, or bridge is fitted and bonded. These restorations are long-lasting and provide strength for many years. You can increase their longevity by brushing, flossing, and coming for regular cleanings and re-care examinations. Find out the ideal restoration for a chipped, cracked or broken tooth by contacting Evolution Dental today. Call 403-208-9965 to schedule your appointment at our office in Northwest Calgary.